Home /BLM, Human Rights, latest_news/Fours years after Bunkerville, where does Cliven Bundy stand now? Recently, I spent the day with Cliven and Carol Bundy at their ranch. I had scheduled some time to come to the ranch attend a celebration of the dismissal of charges but those celebratory plans were quickly dashed as those who languish in lock-up were again brought to the forefront in the hearts of The Bundy’s.“I am not sure what we can do for ‘em,” says Cliven, as we bump down the desert ranch road in the April heat. “Engel and Burleson might have some chance,” referring to the post-conviction relief filings both men have in the motion. “But the ones who’d plead guilty I just don’t know what we can do,” shaking his head. Cliven and Carol are not in the happiest of moods these days; the men left behind weigh heavy on each of them. “The thought of ’em men still living out their days in prison just breaks my heart.” Stopping the truck, we looked over the edge of the northbound bridge of Interstate 15 spanning the Toquah Wash where the famous standoff was held. Cliven described to me about what happened that day. Cliven is careful to be clear neither he or Carol were at the Toquah Wash on April 12, 2014. But, Cliven did see the evidence and discovery in preparation for his own trial, giving him great insight into the actions of all of the Bundy 19. Most he only came to know in Federal Lock-up. as they attempted to direct traffic and the crowds. Once it was over, and the federal agents left, Todd got in his pickup and drove to Mesquite, Nevada, and got a hotel room to get some much-needed sleep. The next day he drove back to Northern Idaho. Todd came to know only years later how close he had become to losing his life that day. The BLM Rangers had taken their safeties off and requested permission to fire upon the men on the bridge only to be ordered to stand down by the Sheriff’s department as they took control ordering federal agents to leave the area. Todd Engel represented himself during his trial and was one of two men to be found guilty in the first trial in 2017. After spending the sum total of one and a half hours at the protest, the Federal Prosecutor is recommending 20 years for Todd to spend in prison; effectively giving him a life sentence. Most of that time at the standoff he spent with the highway patrol, which did collaborate his version of events during his trial. He never took his gun out of the low ready position, leaving it strapped to his chest or pointing it at anyone. Gregory Burleson was another latecomer to the protest that day. As we looked over the I15 bridge, Cliven showed me the route and position he took down into the Toquah Wash. “Burleson didn’t follow the road down like ‘em other protesters,” said Cliven pointing from behind the wheel of SUV we were sitting in. “He had climbed over the Jersey Barrier and took a more direct route into the Wash from the bridge. When he got down in dee wash, Ammon told Burleson to get back to the northbound bridge.” Ammon had assessed the danger and had told anyone with a rifle to retreat back and away from the center of the confrontation they surprising found themselves in. Greg Burleson did exactly as he was told. He got out of the confrontation and kneeled down, away from the Southern I15 bridge and where the Federal Agents took up the position to fire upon the crowd. Then there are the men who were forced into guilty pleas, Jerry Deleamus, Pete Santilli, Eric Parker, Scott Drexler and others who along with Engel and Buerlson. Had all the evidence been available to them and their courtroom jurors would have made very different decisions. Each of the Bundy 19 were under tremendous pressure, life-altering pressure, that is impossible to understand unless you have personally gone through it. It is how the federal government achieves a 97% conviction rate. It’s why nearly everyone who comes into contact with the federal justice system goes to prison, and for a very long time. Most Americans just assume that if you are a targeted by federal prosecutors you must have done something terrible and they are just really good at convicting the guilty. But, in reality, it’s the pressure and manipulation that the prosecution practices that land so many in prison, leaving the remaining who go to trial. And, when they do maintain their innocence they receive the ire of the prosecutors for challenging them, doling out ungodly long sentences like Burleson’s and Engel’s. Mike is an author, radio host, ex-felon, and a highly sought after motivational speaker. To find out the true story of Cliven Bundy, get his new book “Cliven Bundy American Patriot”. My heart and Prayers go out to All the Men still in Prison, those awaiting their trials ( if they get one honestly ), and to Cliven and Carol Bundy. It is a sad time in America when Our Government has turned against us to support their own or others greed. I’m sure most are waiting for our one true person we all prayed for, for a new hope for Our Country, President Donald J Trump. I am Sorry He hasn’t been much help for the Men. Our AG Sessions could be more help also, but he seems be to busy to help anyone, including Our President. If I could help more I will when I can. Prayers for Jeanette Finicum and Her Family with the death of LaVoy to head the household. I can only imagine the struggles y’all have had to go thru and many still are. I also send Prayers for Dwight and Steven Hammond and their Family’s. I also send Prayers for Schaeffer Cox and His Family. I just got a chance to watch the 2 videos made about his story. America’s won’t be over until we can rid Our Country of all these corrupt people who have tried to destroy America, Our Values, Our Justice System, Our Family’s and so much more. God Bless You All. Please Stay Safe and Alert. I Love You All My Brothers and Sister’s in Christ. He is Always Watching and Blessing. Due to circumstances beyond my control, thankfully I was unable to attend this standoff however I was aware of this fight early on and would have been proud to serve. 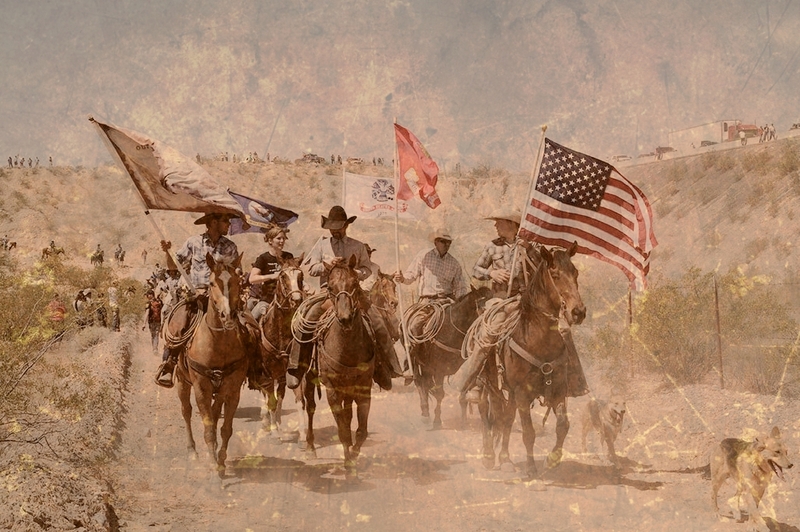 The BLM thugs and mercenaries attending the Bunkerville standoff would most certainly have killed the Bundys that day had it not been for the publicity and the Patriots who showed up to stand by their side. They are all pawns working for the “Deep State” who have been brainwashed to believe that our federal government is serving the citizens of this nation without understanding this nations history, our Constitution, Bill of Rights, Rule of Law, and our Freedoms. Like any cancer if left unchecked, it will consume you and you “this nation” will die. It is truly time to take a stand and yet again fight for our freedoms that our forefathers were willing to die for! Being all equally human, no more or no less human than any other human, we all have an equal stake in justice. No man is born a master and no man is born a beast. The masters are masters because they Usurped the authority they were given by the consent of the governed. (According to St. George Tucker anyone in authority that Usurps authority in a Constitutional Republic commits TREASON against the people.) The Federal Gov. now believes they “can do just about anything they like” because they are Naturally Superior to the rest of us ordinary men and women. Karl Marx Lamented the rise of the middle class above their Natural Superior by tearing asunder of the nexus between the common man and his Natural Superior of the Feudal Estate! These pigs believe they are MORE equal than the rest of us. They carry guns they have NO constitutional authority to carry (there is no authorization in the Constitution for a National Police Force nor for ANY federal official to carry a gun in their capacity as such). They are ALL TRAITORS!!!! Hmmmm… No national police force. I wonder why the wise founders left that little detail out? Well!!! Do we actually need any better explanation than Ruby Ridge, Waco TX, Bunkerville, and the Malheur Reserve (Not to mention thousands of less renown cases)?! I am NOT a criminal just because some oath breaker makes a law!! !